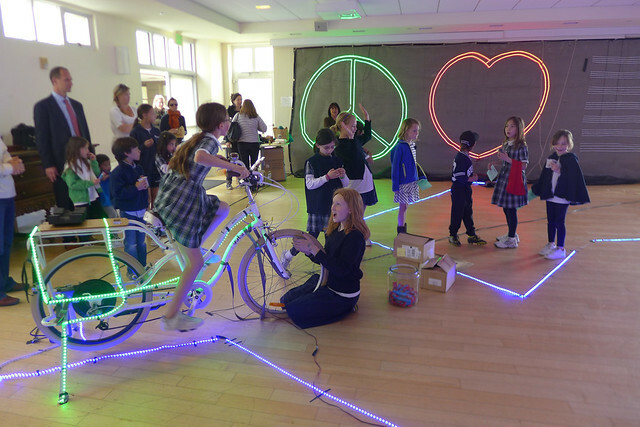 The sLEDgehammer is an interactive light challenge that harkens back to the classic carnival Sledgehammer game. But here, the aim is to convert your peak power output to a beautiful light display. The sLEDgehammer is accurate, motivating, and visible from anywhere in the venue. It’s a fun way to get your event participants thinking, cheering, and breathing. The 9.5′ to 11′ Tower and Stand are a great way to show pedalers their power. Customize the color of the Generator Pro Frame. Above: Get multiple sLEDgehammers to add a competitive element and a larger presence at your event. Pedalers must overcome the challenge phase in order to see the reward sequence. The faster they pedal, the more lights turn on, making it harder and harder to keep increasing the system voltage. If they push the lights all the way to the top of the tower, and keep them on for 3 seconds, they beat the challenge and win the game. Their stored energy is then used up in a dazzling display of light. A difficulty knob makes the game easier or harder. The peak effort required to win is about 200W for the Easiest setting and 600W for the Hardest. In the Dual sLEDgehammer, everything is the same. To decide the winner, you start the two riders at the same time and give the win to the one who pushes the lights higher in the tower or gets the victory sequence to display first. 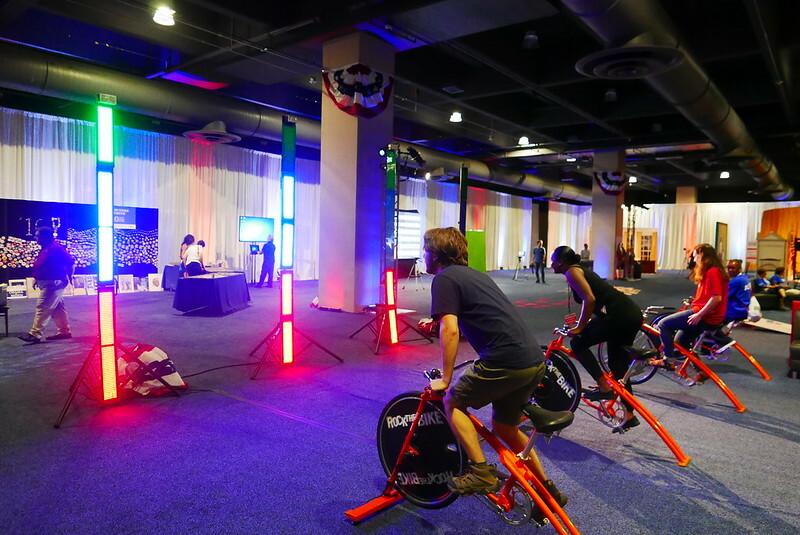 Watch this video to see pedalers compete for sLEDgehammer victory at the 2016 Democratic National Convention! An efficient bicycle generator, such as the Generator Pro. The sLEDgehammer circuit, which comes complete in a strain-reliefed enclosure with an Ultra Capacitor and all power cables. 5 colored LED panels standing to a height of 11 feet tall. Halogen lights at the top to win the game. A wide base untippable tripod stand. The Bike: Any of our hub generators will do. But more than our other activities, pedalers on a sLEDgehammer tend to use their whole body to try to beat the game. You may benefit from the additional stabilization of your generator. The Electric Fender Blender Pro, with its 3′ wide stance, is particularly well-suited to this application. The Circuit: The sLEDgehammer circuit is the brains of the operation, calculating watts as you pedal. The sLEDgehammer comes in an enclosed, strain-relieved circuit capable of handling 1500-Watt surges in power. Depending on how many LEDs you connect, you may need all that power handling. People will try to break this machine. The sLEDgehammer circuit runs cool, calm and collected even when your participants pedal their hardest. The sLEDgehammer runs on an Arduino Pedal Power microcomputer, using the open-source Arduino platform. What this means is that you can optimize or change certain parameters to improve the activity. The sLEDgehammer can be installed in several ways. Our favorite method is doing large custom installs like the ones shown on this page. They can either be done for a single event or on a semi-permanent basis. 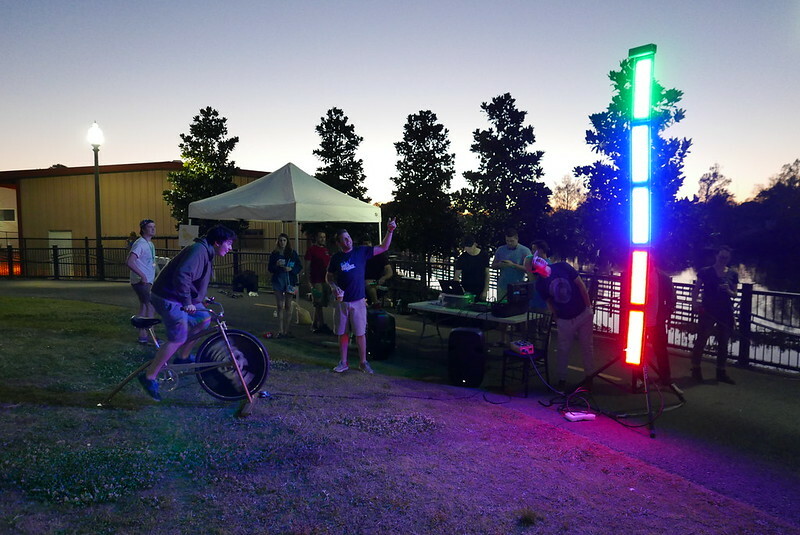 Custom installations use the same components: bike, lights, and circuit; and can be tailored to your event, activity, or facility. We work with you to design and implement the sLEDgehammer. We then provide either full installation and crew at your location or help and guidance for your crew prior to the event. The Tower is 53″ long x 132″ tall, 43″ wide. The Generator Pro is 56″ long, 39″ tall, 31″ wide. Rentable: Yes! Find out more. Custom Installation: Contact us for options and pricing. Build Time: Made to order. Please give us 4 weeks to build the sLEDgehammer, 6 weeks for a Dual sLEDgehammer and 2 weeks for the sLEDgehammer circuitry only. The sLEDgehammer has escaped the tube. 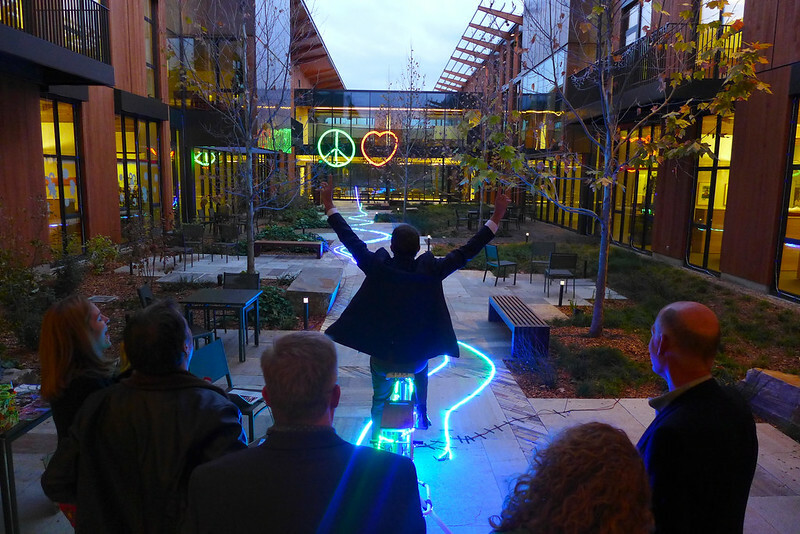 Our Pedal Powered lighting challenge, the sLEDgehammer, has escaped the tube. We’ve both advanced the circuitry and the creativity of this piece of gear, making it even more of a crowd pleaser.